Once again as we approach our busy season, it is with a renewed vitality that we prepare for another mad one. In the early part of the year, we get ready to visit our friends in China again, look at the new innovations, submit new firework designs, place orders and take things a little easy for a while, returning to China for final testing a few months later. Around March/April we get ready for the coming wedding season but still, we are not overly busy. It isn’t until September that we really get going. Almost overnight our team jumps from five to thirty-five, all experts in their field and happy to return to us year after year, Epic HQ being one of the best places to work, the buzz of the company at this time of year is almost addictive. Already all our containers stuffed to bursting have arrived on slow boats from China and all our stock has been packed away. The “Epic Ninja’s” working through the night to ensure a job well done ready for the daily visit of 40 foot articulated trucks, topping up our ten on-site containers just off the M1 junction 36 near Sheffield. Forklift trucks are fired up for the first time this year, crew buses for transporting the various staff from our head office near Sheffield to our underground storage in Lincoln whizzing up and down the A15 at all hours of the day and night. Our team of ten ADR (specialist explosive trained) drivers, prepare their vehicles ready for the thousands of miles our courier team will travel to get the fireworks all over mainland UK in time, with over 99.9% of deliveries being made exactly when expected, customers being kept informed all the way. The long-awaited brochures are ready for this year’s mailshot, eager customers calling daily to check they are still on our mailing list. Over the next several weeks we expect to welcome back over 10,000 customers, each with a beaming smile as they enter our showroom, the biggest fireworks shop in the UK, and as far as we know the only custom-built firework shop in Britain. Although we are open seven days a week all year round, we go into overdrive working 14 hours days from now till New Year’s Eve, but in all honesty, we love it, as the saying goes “time flies when you’re having fun”. It is, I believe, the forward planning, commitment, quality, prices and genuine love of what we do that stands us apart from other firework companies. But, I would say that, wouldn’t I!? The quality of our brands: Epic, Majestic, Paramount and Marvel speak for themselves as well as the price, buying in huge quantities allows us to sell our fireworks at half price or less. If you have never purchased fireworks from us and have any doubts, watch all our fireworks in action at epicfireworks.com, read our customer’s testimonials, comments and Google reviews, or call us, we are happy to give any advice, hints tips whatever you need. 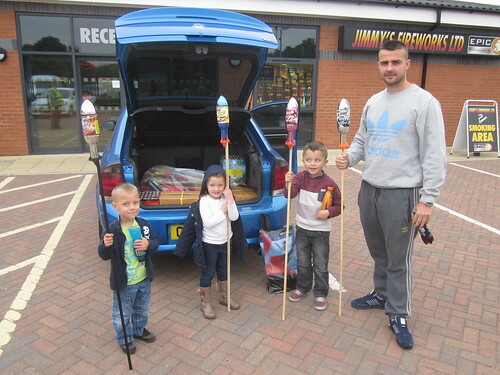 Carrying the largest range of fireworks in the UK with over 50 different rockets and 150 barrages, we guarantee to have something to suit any budget big or small, loud or quiet fireworks we can supply them all. We are 2 minutes from Junction 36 of the M1 (heading Sheffield North) and are open 7-days a week from now until Christmas, to meet demand. At the moment, due to moving goods from warehouse to Head Office, we are available from around 8:00am to 5:00pm but, if you are coming over and will be here a little later than planned, call and let us know and we can wait for you.